A 1.5 litre pot that is injection moulded flat and ships about 90,000 pieces per 40 ft shipping container. 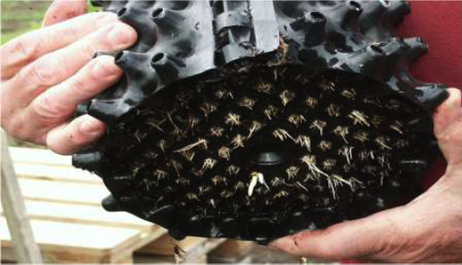 Uses three dimensional air root-pruning that enables direct sowing seed to large containers. designed for a shelf life of days. The seedlings shown at the end of the Y2010 trials were all sown on the same day 9 months earlier and are now are all past their use by date. The solution? First, get the right tools and procedures. Then skilled workers; trained tree planting tradesmen would make a big difference. “Advanced Tree Teamwork” is essential. Finally, measure outcomes and publish the results. 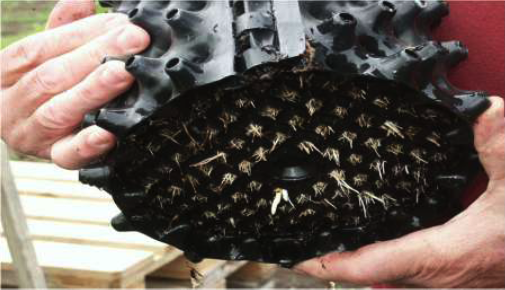 After 8 years of trials, we have learned to manage trees by pruning their roots in all three dimensions 24/7 – starting a few days from germination. I have spent about 20 years seeking to control a tree’s growth in a container through its root system. 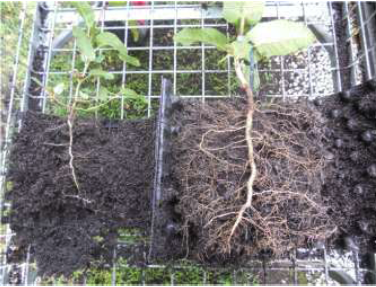 For the first time, downward pointing roots can be made to grow on down and colonise the planting site below the root ball. We just have to have 24/7 automatic air root-pruning. *Shelf life of many months. *4 months to sale not six. *25 pots per pallet not 16 taper pots. *Selecting the best seedling without pricking out. Click on PDF below the photos for a complete description. Patents are pending in US and Europe. If and when granted they will be offered for sale or licensing. A non exclusive right to use the TradeMark RocketPot in USA can be negoriated. Like to tender an offer?. We will accept a non refundable option fee of USD 100,000 for an exclusive right valid for 6 months to consider the purchase of the Chinese Patent. The option agreemnt with the successful bidder will include a draft sales contract clearly stating the successful tender purchase price. Tenders for the Chinse patent close at 12.00 noon Beijing time on Monday 30 July 2012. We reserve the right not to accept any tender.